(C) 2011 Michael J. Sharkey. This is an open access article distributed under the terms of the Creative Commons Attribution License, which permits unrestricted use, distribution, and reproduction in any medium, provided the original author and source are credited. A new genus of Agathidinae (Hymenoptera, Braconidae), Neothlipsis, is proposed to include 10 species. Nine of these species were formerly included in the polyphyletic genus Therophilus Wesmael 1837, formerly referred to as Bassus. A new species, Neothlipsis parysae, parasitic on Samea multiplicalis (Guenée), is described. The ten described species transferred to Neothlipsis are:, Neothlipsis agathoides comb. n. for Bassus agathoides Newton & Sharkey 2000; Neothlipsis agilis comb. n. for Bassus agilis Cresson, 1868; Neothlipsis brevicauda comb. n. for Bassus brevicaudus Muesebeck, 1932; Neothlipsis californica comb. n. for Bassus californicus, Muesebeck 1927; Neothlipsis cincta comb. n. for Microdus cinctus Cresson, 1873; Neothlipsis coleophorae, comb. n. for Bassus coleophorae Rowher, 1915; Neothlipsis discolor comb. n. for Microdus discolor Cresson, 1873; Neothlipsis nigricoxa comb. n. for Microdus nigricoxus Provancher, 1886; Neothlipsis petiolate comb. n. for Bassus petiolatus Muesebeck 1932; Neothlipsis taeniativentris comb. n. for Microdus taeniativentris Enderlein, 1920. 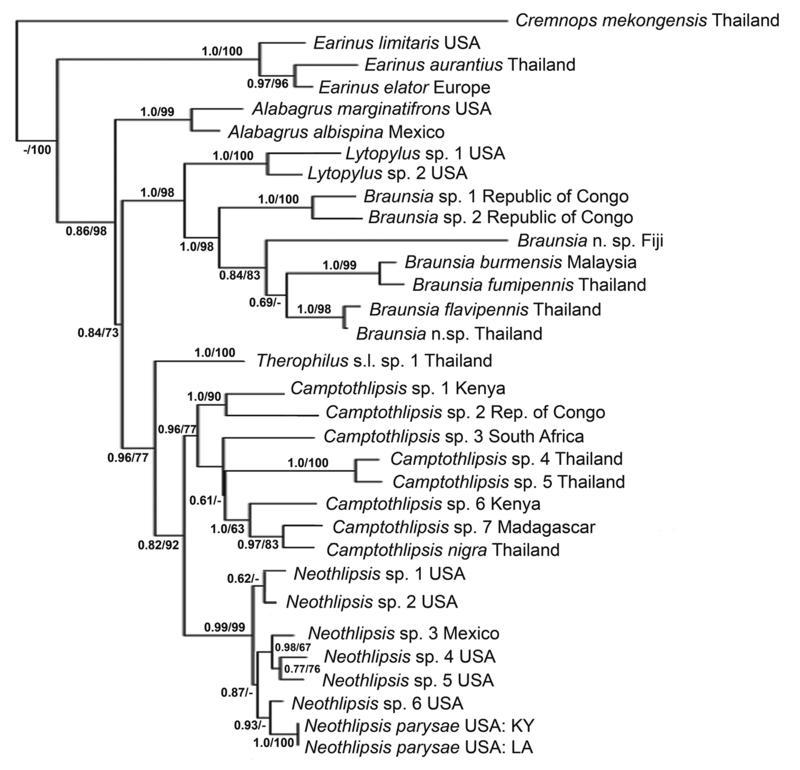 Phylogenetic analyses support the sister relationship between the new genus and Camptothlipsis. The type material of the new species is deposited at the Hymenoptera Institute Collection at the University of Kentucky, the United States National Museum, the Florida State Collection of Arthropods, and the Louisiana State Arthropod Museum. 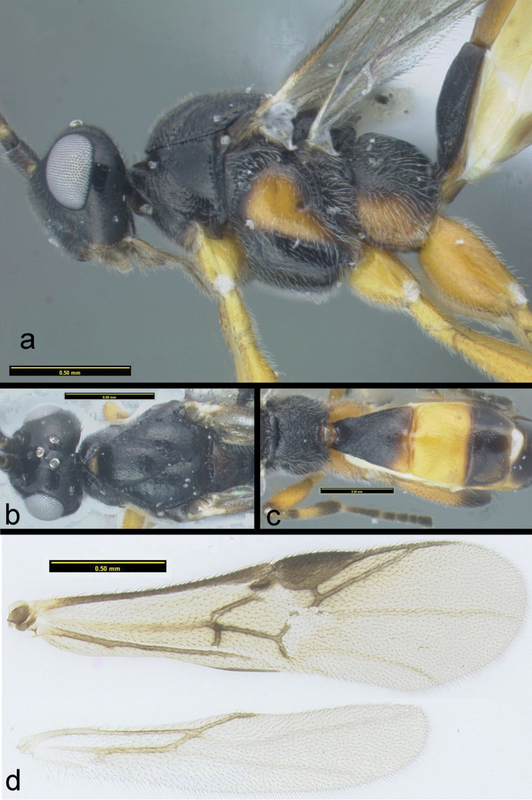 The primary objective of this paper is to describe a new species of agathidine braconid parasitic on Samea multiplicalis (Guenée), which was discovered by the junior author, KAP. 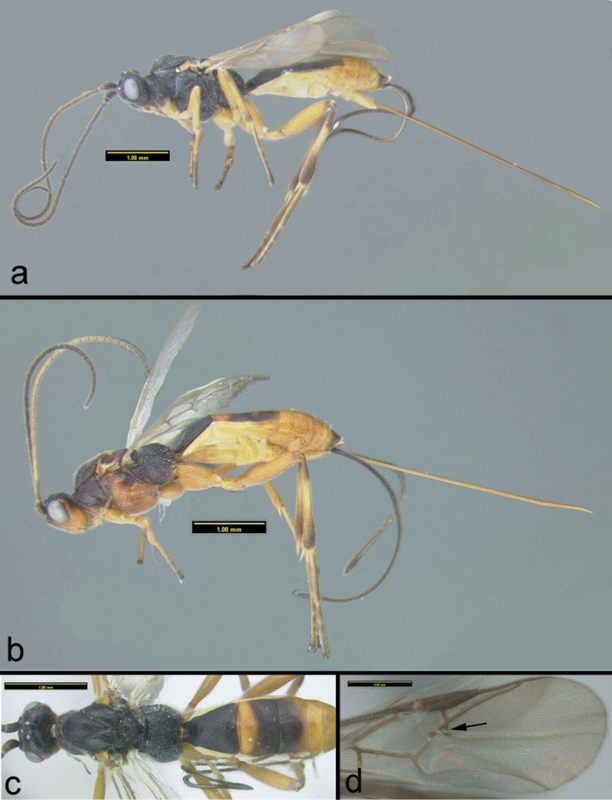 A secondary objective is to propose a new genus to include this species and nine others formerly included in the polyphyletic genus Therophilus Wesmael, 1837, referred to as Bassus Fabricius, 1804 in most recent publications (see Sharkey et al. 2006, 2009). Regions D2-D3 of 28S rDNA were sequenced using the following primers: 28SD2hymF 5’ - AGAGAGAGTTCAAGAGTACGTG - 3’ and 28SD3hymR 5’ - TAGTTCACCATCTTTCGGGTC - 3’. Sequences were edited using Geneious Pro v4.7.5 (Drummond et al. 2009) and aligned based on a secondary structure model for Ichneumonoidea developed by Yoder and Gillespie (2004) and Gillespie et al. (2005). Regions of expansion and contraction (REC), regions of slipped-strand compensation (RSC), and short regions of alignment ambiguity were further aligned/corrected by eye. Phylogenetic trees were constructed using maximum parsimony (MP) and Bayesian analyses. Maximum parsimony analyses were performed using TNT (Goloboff et al. 2008). A traditional search with 5000 random addition sequences followed by branch-swapping, saving 5 trees per replication, was performed. Symmetric resampling (Goloboff et al. 2003) of the aligned sequences was carried out with TNT, using 1, 000 replicates. The Bayesian analysis was performed using MrBayes v3.1.2 (Ronquist and Huelsenbeck 2003). Best-fitting DNA substitution models were determined using MrModeltest2.2 (Nylander 2004). The general time reversible model of evolution with a parameter for invariant sites and rate heterogeneity modeled under a gamma distribution (GTR+I+G) was determined as the best-fitting model. Each Bayesian analysis consisted of two independent Bayesian MCMC runs initiated from different random starting trees. The analysis ran for 2, 000, 000 generations, reaching a topological similarity criterion of 0.005; trees were sampled every 200 generations. Twenty-five percent of the trees from each run were removed as burn-in upon topological convergence. FSCA	Florida State Collection of Arthropods, Gainesville, Florida, USA. HIC	Hymenoptera Institute Collection, University of Kentucky, Department of Entomology, Lexington, Kentucky, USA. USNM	National Museum of Natural History, Smithsonian Institution, Washington DC, USA. Microdus cinctus Cresson, 1873, deposited in the Academy of Natural Sciences, Philadelphia, Type # 1718.1. Head: Lateral carina of frons lacking (Fig. 3b); gena rounded posteroventrally (Fig. 3a); interantennal space raised to converge on single point anteromedially; antennal depressions shallow (Fig. 3b); labial palp with four segments, third segment reduced; apical antennomere rounded. Mesosoma: Mesoscutum with sculptured notauli (Fig. 3b); posteroscutellar depression absent; median areola of metanotum surrounded by well defined carinae laterally and posteriorly; propodeum areolate rugose with granulate microsculpture (Figs 2b, 3c, 4c); propleuron mildly convex to flat; metapleuron granulate (Fig. 3a); propodeal pseudosternite appearing as a narrow band separating hind coxal cavities from metasomal foramen. Legs: Fore tibial spur not elongate, fore tibia lacking pegs; tarsal claws simple or with a rounded basal lobe; midtibia with apical and subapical pegs; hind tibia with apical pegs. Wings: (Figs 3d, 4d): Rs+Ma vein of fore wing incomplete and not tubular throughout; second submarginal cell of fore wing reduced and triangular or absent; fore wing 3RSb straight to slightly sinuate; hind wing crossveins r and r-m absent; hind wing Cub present as nebulous or spectral vein and sometimes as a short tubular stub. Metasoma: Median tergite 1 distinctly granulate and lacking pair of longitudinal carinae (Figs 2b, 3c, 4c); median syntergum 2+3 weakly granulate to smooth, with transverse depression separating terga 2 and 3; ovipositor varying from length of metasoma to slightly longer than body. Semistrict consensus tree of two trees inferred from 28SrDNA sequence data aligned by secondary structure, one the majority rule tree using Bayesian methods and the other the unique tree produced using maximum parsimony. Bayesian analysis runtime = 2 million generations (25% burnin). Branch support: Bayesian posterior probabilities / symmetric resampling (1, 000 replicates). (-) indicates branch support below 0.5 / 50. A wide range of hosts is recorded, mostly in the Lepidopteran families Tortricidae, Crambidae, Pyralidae, and Coleophoridae. Widespread in the Nearctic and northern Neotropical regions. From the Greek, neo (new), and thlipsis (pressure or constriction). The name refers to the sistergroup relationship with the Old World genus Camptothlipsis and the fact that it is restricted to the New World. The genus is feminine. Members of the genus are very similar to those of Camptothlipsis. The only obvious differences are that a small second submarginal cell is present in most species of Neothlipsis and is the ground plan for the genus, whereas it is absent in all Camptothlipsis. Furthermore Neothlipsis is restricted to the New World and Camptothlipsis to the Old World. The cladogram in Fig. 1 is produced from a subset of data from a much larger data set of 28S rDNA. We conducted analyses of numerous permutations of the data set with Camptothlipsis and Neothlipsis always obtained as sister groups. Figure 1 represents a semi-strict consensus tree of the Bayesian majority rule tree and the unique maximum parsimony tree. The trees did not contradict each other at any node; however, some branches were supported in one analysis and not the other. The granulate sculpture of the first metasomal median tergite (T1) combined with the lack of lateral longitudinal carinae on T1 are apparent morphological synapomorphies supporting the relationship. Neothlipsis parysae and Neothlipsis agathoides are unique amongst members of the genus in that their tarsal claws are simple, lacking a basal lobe. As indicated in Fig. 1, Neothlipsis parysae is well nested within Neothlipsis. There are no obvious morphological synapomorphies for members of Neothlipsis. They share several synapomorphies with Camptothlipsis, e.g., presence of granulate sculpture on the first median metasomal tergite (Fig. 3c), lack of a pair of longitudinal carinae on first median metasomal tergite (Fig. 3c), and the reduced size of the second submarginal cell (Figs 3d and 4d). Since members of Camptothlipsis are restricted to the Old World, those of Neothlipsis may be distinguished from other agathidines occurring in the New World using the three aforementioned character states. Ten described species are here transferred to Neothlipsis, i.e., Neothlipsis agathoides comb. n. for Bassus agathoides Newton & Sharkey, 2000; Neothlipsis agilis, comb. n. for Bassus agilis Cresson, 1868; Neothlipsis brevicauda comb. n. for Bassus brevicaudus Muesebeck, 1932; Neothlipsis californica comb. n. for Bassus californicus Muesebeck, 1927; Neothlipsis cincta comb. n. for Microdus cinctus Cresson, 1873; Neothlipsis coleophorae comb. n. for Bassus coleophorae Rowher, 1915; Neothlipsis discolor comb. n. for Microdus discolor Cresson, 1873; Neothlipsis nigricoxa comb. n. for Microdus nigricoxus Provancher, 1886; Neothlipsis petiolate comb. n. for Bassus petiolatus Muesebeck, 1932; and Neothlipsis taeniativentris comb. n. for Microdus taeniativentris Enderlein, 1920. All holotypes of the species listed above have been examined by the senior author. Neothlipsis parysae Sharkey, sp. n.
Neothlipsis parysae: 1. Hind femur melanic in apical third (Fig. 2a). 2. Head always mostly melanic (Figs 2a, 3a). 3. Ovipositor distinctly shorter than body (Fig. 2a). 4. Body length less than 3.6 mm. 5. Second submarginal cell of fore wing usually present (80%) (Fig. 3d). Neothlipsis agathoides. 1. Hind femur entirely pale or melanic in less than apical fifth (Fig. 4a, b). 2. Head color usually pale at least in ventral half (Fig. 4b), rarely mostly melanic (Fig. 4a). 3. Ovipositor as long as body (Fig. 4a, b). 4. Body length more than 3.6 mm. 5. Second submarginal cell of fore wing usually absent (95%) (Fig. 4d). Holotype female: Length: 3.4 mm (3.2–3.5 mm). Color: (Figs 2, 3). Flagellomeres (with antennae directed anteriorly) dark brown dorsally, fading to dark orange ventrally (ventrally ranging from entirely black to yellow, rarely flagellum pale in basal third); anterior orbit of eye black, the posterior orbit orange (ranging to entirely black); mouthparts pale yellow with black highlights, remainder of head black dorsally with orange patches laterally (ranging from entirely black to mostly orange with dark highlights); fore leg orange with tarsus darkened distally; middle leg orange with tibia darkened distally, tarsomeres mostly dark; hind coxa dark orange (ranging to nearly black, especially in males); hind femur dark orange (ranging to black with some orange, especially in males); basal black band present on hind tibia; hind tibia black in distal half, otherwise orange; wings hyaline; mesosoma black with orange tegula (ranging from black with black tegula to black with orange highlights, often with an orange spot on the mesopleuron); metasoma pale yellow ventrally (ranging to dark orange); with tergum 1 entirely black, tergum 2 black in the posterior half and orange anteriorly (or black with only the anterior margin orange), tergum 3 black with orange posterior margin, remaining terga orange with dark highlights. Head: Number of flagellomeres = 26; ratio, distance between ocellus and compound eye to distance between lateral ocelli = 1.7; temple not bulging as viewed dorsally; ratio, malar space to eye height = 0.53. Legs: Midtibia with eight spines; hind tibia with eight spines (6–10); tarsal claws simple, basal lobe absent. Wings: Second submarginal cell of fore wing absent (Fig. 3d) (or rarely very small). Metasoma: (Figs 2b, 3c). Ratio, length of median tergum 1 to apical width of median tergum 1 = 1.13; median terga 1, 2, and 3 granulate; ovipositor slightly shorter than body. Neothlipsis parysae a Lateral habitus b Dorsal habitus. Neothlipsis parysae a Lateral head and mesosoma b Dorsal head and thorax c Dorsal propodeum and metasomal terga 1–3 d Wings. Neothlipsis agathoides a Lateral habitus of a melanic specimen b Lateral habitus of a pale specimen c Dorsal habitus d Fore wing, arrow pointing to second submarginal vein. Samea multiplicalis (Guenée) (Lepidoptera: Crambidae) occurs in the southeastern United States and south to Argentina (Knopf and Habeck 1976). Large populations of the adult moth are often found at lights in Louisiana and are one of the most common species observed (Landau and Prowell 1999). The larva is a natural control agent and generalist herbivore that feeds on a variety of aquatic plants including salvinia (Salvinia minima Baker, Samea molesta Mitchell, and Samea auriculataAublet), water hyacinth (Eichornia crassipes (Mart.) Solms), waterlettuce (Pistastratiotes L.), water fern (Azolla caroliniana Willd., and Azolla pinnata R. Brown) (Knopf and Habeck 1976, Sands and Kassulke 1984, Tewari and Johnson 2011). Groups of approximately 50 Samea multiplicalis larvae were collected by hand from mats of common salvinia (Salvinia minima Baker) at four field locations across southern Louisiana several times during 2006 and brought back to the lab (for a total of 13 sampling points). Individuals were reared individually in diet cups and provided with fresh vegetation until pupation. Parasitism rates of Neothlipsis parysae varied between sites, ranging from 0% to 38% with an average parasitism rate of 9.9% for all larvae reared (S. Tewari, unpublished data). Several other hymenopteran parasitoids have been described from Samea multiplicalis populations in Florida, but we have only reared Neothlipsis parysae. First instar caterpillars of Samea multiplicalis are attacked, and the parasitoid pre-pupa emerges from the last larval instar of the host (G.S. Wheeler, unpublished data). Individual wasps are frequently observed in Louisiana on aquatic vegetation during the late spring and early summer. Collections of insects associated with Samea minima were taken from May to November 2009 in Gramercy, Louisiana, and individuals of Neothlipsis parysae were most abundant from May to July but persisted in low numbers until September. The species is named after Katherine Parys in recognition of her discovery of the species. HOLOTYPE: Female, USA: Louisiana: Ascension Parish, 30°09.804N, 90°48.643W, swamp, 9.vi.2010 (HIC). PARATYPES: 88 males, 37 females, same locality data as holotype with dates from June to September of 2009 and June 2010. 10 females, Kentucky, Hopkins Co. Thomas Farm, 37°20.36N, 087°41.26W, Malaise trap, swamp, viii-ix.2010. Paratypes are deposited in the USNM (9 ♀, 15 ♂), FSCA (9 ♀, 15 ♂), LSAM (15 ♀, 39 ♂) and HIC (14 ♀, 19 ♂). Neothlipsis parysae USA: KY, 13-29.viii.2010, HIC. GenBank accession number JF297971 and Neothlipsis parysae USA: LA, 9.vi.2009, HIC. GenBank accession number JF297972 (Fig. 1). Support for MS was provided by NSF EF-0337220. Thanks to Erika Tucker, Carl Ransom, and Tony Brown for their help in collecting specimens and to Rudy Thomas and Pam Corbin for allowing use of their farm in Kentucky. Seth Johnson, Jordan Fryoux, and Anna Meszaros were instrumental in providing assistance in Louisiana. James Boyce graciously allowed us use of his property. This project was funded in part by Louisiana Department of Wildlife and Fisheries Contracts #673252, #686647, and #696303. Knopf KW, Habeck DH (1976) Life history of Samea multiplicalis. Environmental Entomology 5: 539-541. 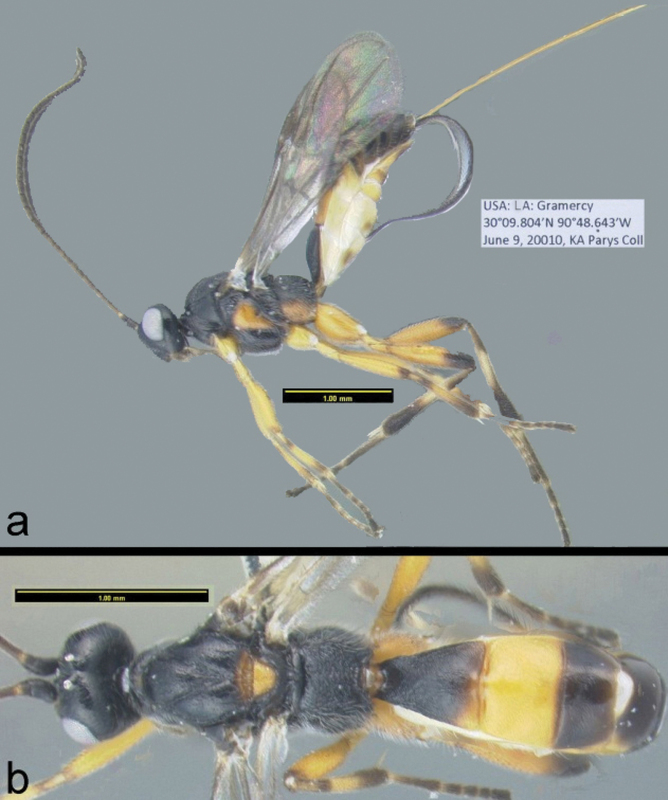 Sharkey MJ, Yu DS, van Noort S, Seltmann K, Penev L (2009) Revision of the Oriental genera of Agathidinae (Hymenoptera, Braconidae) with an emphasis on Thailand including interactive keys to genera published in three different formats Zookeys 21:19–54. Tewari S, Johnson S (2011) Impact of Two Herbivores, Samea multiplicalis (Lepidoptera: Crambidae) and Cyrtobagous salviniae (Coleoptera: Curculionidae), on Salvinia minima in Louisiana. Journal of Aquatic Plant Management 49 (1): 36-43. Yoder M, Gillespie J (2004) jRNA. Exploring insect phylogeny using RNA secondary structure. http://hymenoptera.tamu.edu/rna.